Ever wish you could noseride like this? Now you can! The new KOANDA Noserider dramatically improves noseriding, letting you stay on the tip -- seemingly for-e-v-e-r -- flying through the best noserides of your life. Want noseriding ecstasy... get a KOANDA today. During prototype testing, Israel Paskowitz rode one wave at Malibu from first point almost all the way to the beach and never got off the nose! "The tail felt like it was nailed into the wave," Israel said afterward. "It's absolutely unreal!" How does it work? The Coanda effect is what does it! In 1930, a Romanian scientist named Henri Coanda discovered a physics principle that became known as the Coanda effect. This principle says: "When a jet stream (of air or water) comes into contact with a curved surface, it will attach itself to and follow the curve." When surfing, the Coanda effect causes water streaming by to pull on the KOANDA itself. And the faster the wave, the better it works. 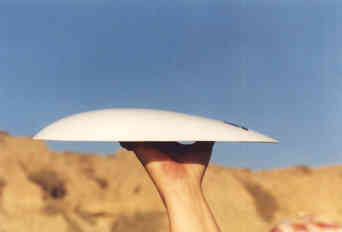 That's because another physics principle, called the Bernoulli effect, is assisting at the surface layer of the KOANDA. As speed increases, the Bernoulli effect reduces pressure and creates a vacuum layer right on the KOANDA surface, causing it to continually try to enter the vacuum. This creates the pull that holds the tail down and into the wave. Or for a wing the lift that makes an airplane fly. An added benefit of making the tail behave, while you're on the tip, is that the concave nose can consistently operate with optimum lift because the tail is held in position. Now, you get pull and lift which creates a more stable platform for longer, superior noserides. It is so stable, the difference it makes on your board is like going from riding the picnic bench to riding the picnic table. With this knowledge in hand, some of the best '60s noserider boards were made with most of the rocker in the tail to help hold the tail into the wave. The next step didn't take a rocket scientist (but we know some). In 1994, when Bob Howard saw how much pull the little teaspoon had, it wasn't long before the idea came to him that an object many times that size might exert quite a force, with the ability to hold the tail of a longboard into the wave effectively. Now we could make any longboard noserider better, he theorized--even a so-called noserider board. Soon Howard began testing prototype versions, until he perfected the new KOANDA of today. 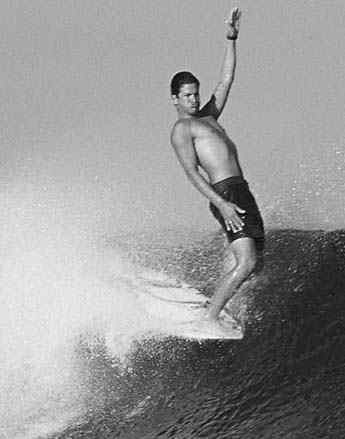 In the beginning, Israel Paskowitz used a KOANDA to get his 16.5-second noserides going backside at the "C" Street Noseriding Contest (Dec. 3-4, 1994, in Ventura, Calif. See Longboard Magazine, p-25, April/May 1995). It just works. That's all there is to it! These guys know! 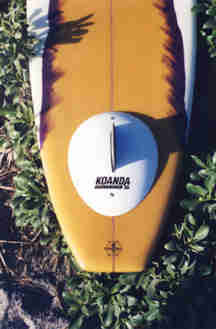 SURFER and Longboard magazines reported on the original KOANDA in 1995. "It's insane. I should have had to get off the nose, but I didn't have to." -- Israel Paskowitz. "It just works. That's all there is to it." -- Wingnut. KOANDA noserides just keep going and going. Howard says, "You've really got to experience this. Hearing about it is like hearing about ice cream, versus actually eating it. Once you've had some, then you know." It now attaches over the fin, via a slot in the top. Fin tabs are installed in the fin box before and after the fin, where they can't fall out even without the KOANDA in place. Then, two screws are used to "bolt" the KOANDA in position. If you think the KOANDA might be a hindrance in larger surf conditions, it is now removable in less than 10 seconds.
. They work on longboards from 7' 6" to 11' long, with single fin box or a tri-fin with long box setup. KOANDA's are made of light weight, molded fiberglass. Weight is 7 ounces. When you mail your check, also please E-mail us to confirm your order. Allow three weeks for delivery.